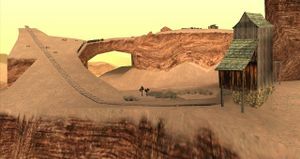 Arco del Oeste is a rock formation in Grand Theft Auto: San Andreas at the northwestern edge of Bone County, San Andreas, just south of Valle Ocultado and west of Las Brujas and El Castillo del Diablo. It juts into Sherman Reservoir, providing pristine views of nearby Sherman Dam to the south, and features a natural arch and a mesa, an abandoned mining facility, wooden shacks to the top, and a small dock on the southwestern side. Its name translates roughly from Spanish as Arc of the West, apparently taking its name from its natural arch and location towards neighboring Tierra Robada. The abandoned mine at the top of Arco del Oeste, which runoff (towards the left) is designed ideally to serve as a ramp for stunt jumps. 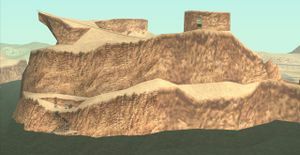 Arco del Oeste is the primary location of a mission for Mike Toreno, in which Carl Johnson shoots down numerous helicopters from atop the rock formation using a rocket launcher to keep a cargo helicopter safe. It is also the end-point for a mission for The Truth later, wherein Carl delivers the "Black Project" to him, who is on top of the rock formation. It is featured once again in the Las Venturas strand of missions, wherein Carl is tasked yet again by The Truth to rescue two drug addled people, later named as Kent Paul and Maccer. This page was last modified on 9 August 2012, at 13:59.